Thank you for seeking employment at Tropical Sno! 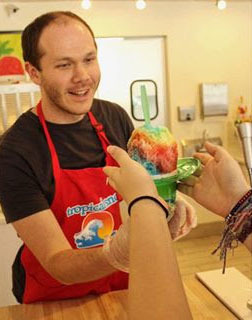 Professional behavior, attitude, and a passion for customer service and Tropical Sno. Ability to work on your own and be self-motivated. Available to work at least 4 shifts every week (15-20 hours min.) regardless of school, other jobs, or family activity commitments. Our season runs March through early September. Have a car and valid driver’s license. Must be able to obtain Restaurant workers Health Permit. a competitive hourly pay rate + cash & credit card tips once you’re out of training. Time-off requests and a flexible schedule. Raises for hard working, self driven people; We seek to promote team leaders and motivators. If this sounds like something you’re interested in, please click the location below that you are interested in and fill out the online application. We will contact you to schedule a face-to-face interview. Thanks so much for your interest. We hope you’ll consider Tropical Sno for 2019. Waldo Tropical Sno, LLC is an Equal Opportunity Employer.